For breakfast with eggs? As party food? As a side for a fancy dinner? The possibilities are endless. 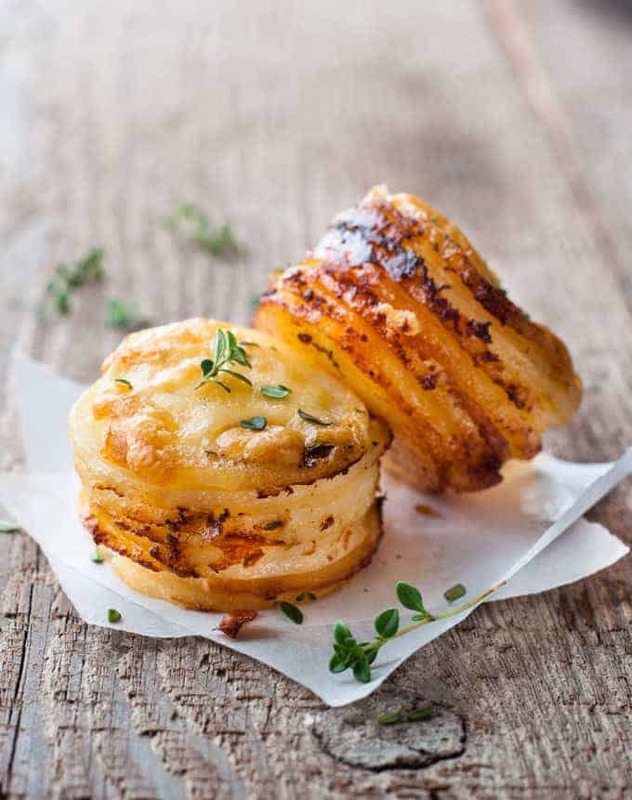 And these Mini Potato Gratin Stacks are just 85 calories per serving! 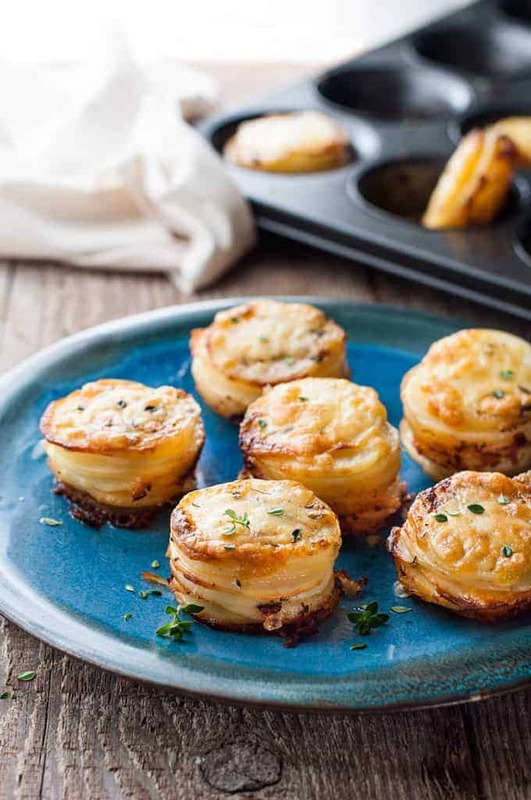 All you need to know is that these Mini Potato Gratin Stacks are cheesy, creamy and ridiculously irresistible. I mean, come on. Potatoes + cheese + cream + garlic + butter. BAM! That’s a home run right there! These are inspired by the French Food Goddess Julia Childs and her classic French Potato Gratin / Dauphinoise which I posted last year. It is dangerous for me to make her Potato Dauphinoise when I don’t have company because I literally cannot stop eating it. I swear, she is single handedly responsible for the abnormal amount of stretchy clothes in my wardrobe. French food. Butter. Cream. Butter. Garlic. Cream. By making these in mini form, you can convince yourself they are almost healthy because each mini stack only has 85 calories. Believe me when I say it DOES NOT TASTE LIKE THAT! The reason there is no photo with all 12 that this recipe makes is because I simply could not resist helping myself to 1 2 3. It was lunch!! LUNCH! Don’t judge me!! When you combine potatoes, cream, cheese, garlic and butter, you just can't go wrong. 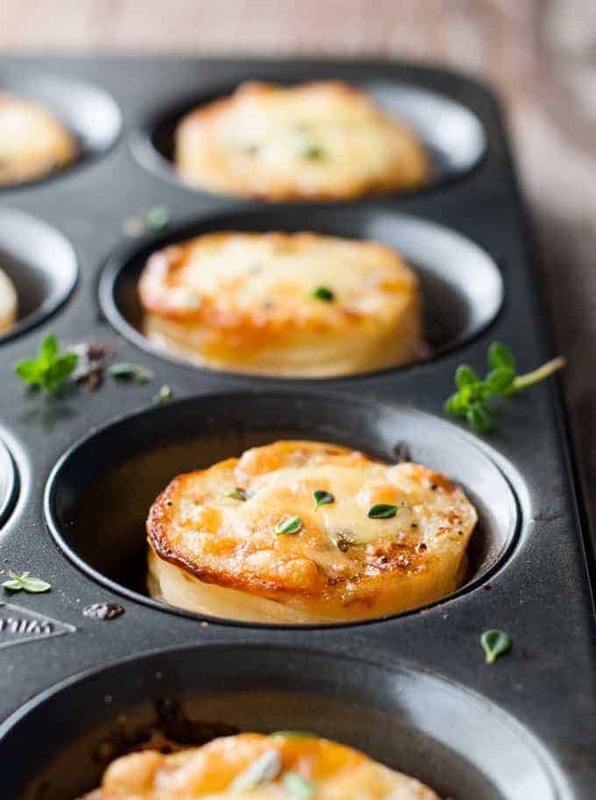 These individual size portions made in a muffin tin are great as a side, for breakfast with eggs (and bacon!) OR as finger food for a party! Just 85 calories per piece and they're freezer friendly too! Recipe VIDEO below. Spray a standard 12 hole muffin tin with oil. Peel potatoes. Stand upright then cut into cylinder shapes, then slice potatoes into thin slices around 2mm/ 1/10" thick. Place butter, garlic, cream, salt, pepper and dried thyme in a microwave proof cup or bowl, then melt in 30 second bursts. Place potato slices into the muffin tin so they go halfway up the muffin tin holes. Try to match by size to make them into neat stacks. 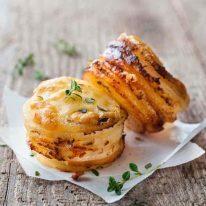 Drizzle each potato stack with 1/2 tsp of cream mixture. Sprinkle HALF the cheese over the potato stacks. Top with remaining potato slices. Drizzle with remaining cream mixture and remaining thyme. Cover loosely with foil and bake for 35 minutes. Remove from oven, sprinkle with remaining cheese and bake without foil for 10 minutes or until golden and the potato is soft. Breakfast - serve with eggs and bacon. Dinner - serve as a side. Finger food - serve warm as is. 1. You need to use starchy potatoes as they breakdown when cooked, becoming nice and fluffy on the inside and golden and crunchy on the outside. The best to use are Russet (common in the US), Dutch creams, King Edwards or red delight. However, great all rounders like golden delight, coliban, red rascal and Sebago (popular in Australia - the dirt brushed ones) still works great. I use Sebago which are the brushed potatoes you can get from any supermarket in Australia (ie. the ones with dirt on them). If you are based in the US, a great all rounder to use is Russet which I understand is one of the most widely used potatoes in the US. Get long large ones that are suitable to cut into cylinder shapes. 2. Fantastic for making ahead! Bake per recipe then either freeze them (defrost before reheating) or keep them in the refrigerator. Them pop them in a 180C/350F oven for 10 minutes just to heat through. 3. Spraying the muffin tin + the butter and cream helps keep the gratin stacks from sticking to the muffin tin. Also, the muffin tin I use is non stick. If your muffin tin is not non stick, spray it generously with oil before putting the potato in to ensure it slips out easily! Because starchy potatoes are used for this recipe, they breakdown and become soft so they sort of bond together which helps keep these stacks upright. Some might slide slightly when you take them out but the resting time helps "set" them. 4. Any pourable cream is fine though thickened / heavy cream will yield creamiest result because they have a higher fat content. 5. 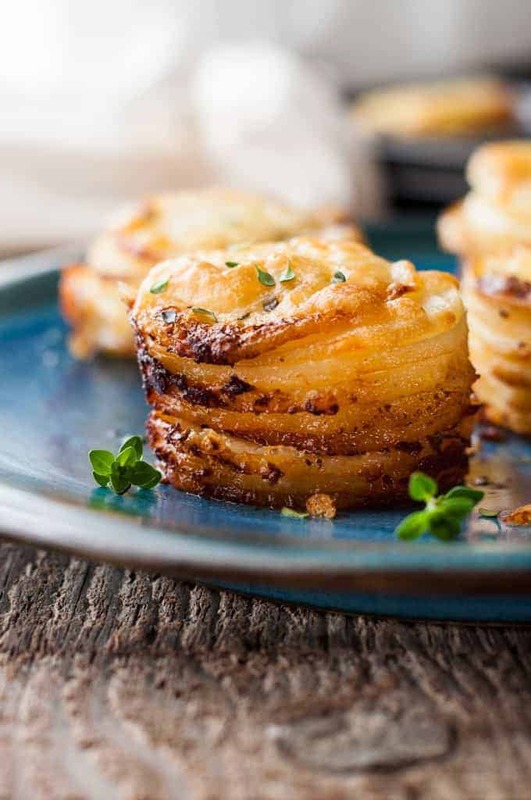 Mini Potato Gratin Stacks nutrition per serving. Insanely sensible! Tried these and they look beautiful! Just wondering if you freeze in muffin tins.. And reheat in them.? Do they have to be completely thawed before reheating? Just made these, they look beautiful. I’m planning on freezing… Do I keep them in muffin tins and reheat in those? Amazing recipe! I made these with mushroom sauce from your Beef Stroganoff link – a perfect match. Great idea Julia, sounds divine! Hi… Loved your recipe. 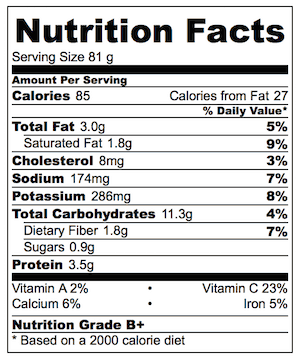 Is there a replacement for cheese? Or a way to reduce it? Your writing is so enthusiastic I can hardly wait to try these! Your recipe was found by me on Pinterest. Thank you. You’re so welcome Mary, I hope you try my recipes and love them! I made these potatoes last Christmas and were a big hit. However many of my family are not thyme lovers. Is there a substitute for the thyme that will still enhance this recipe? Any suggestions?